Pamplin Media Group - Care to dance? Want to learn how to ballroom dance? Lake Oswego Parks & Rec has several levels of classes you can take. In Ballroom Dance level one, students learn the smooth foxtrot and the lively Latin cha-cha. You'll be ready for the dance floor after learning the basics and beyond of these two dances. This class meets from 7-8 p.m. Thursdays, April 4May 23. Cost is $66. 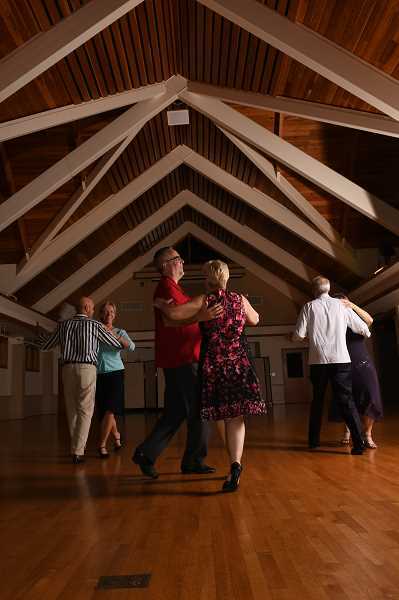 Ballroom Dance level two focuses on the elegant waltz and the fun and sassy American tango. Students learn the basics and beyond. The class meets from 8-9 p.m. Thursdays, April 4-May 23. Cost is $66. Both classes are for those age 16+ and are held at Christ Church Parish. Nia Try-It-Out-Free Day — Fun, nonimpact, high-energy movements condition the body, mind, emotions and spirit. The choreography integrates dance, martial arts and healing with moves and music to inspire joy and health. Free trial day for ages 16+, 6-7 p.m., Tuesday, April 9; actual class will begin April 16, Adult Community Center, free. Beginning to Rock Camp — Newcomers are invited to explore drums, bass, guitar, keyboards and vocals, and learn the fundaments of music, including pitch, melody, harmony and rhythm. For ages 5-7, 9 a.m.-noon, March 25-29, CCP, $147. Songwriting Wordsmith Camp — Learn to put your musical and lyrical ideas down on paper. If you already play, or want to learn the basics of the piano or guitar, this camp will start you on your musical journey. This camp is for all genres and skill levels. For ages 8-12, 1-4 p.m., March 25-29, CCP, $147. Harry Potter Magical Engineering With Legos — Find Platform 93/4, build Hogwarts express train, work cooperatively to construct the mysterious Hogwarts Castle, and soar on the wings of a Norwegian ridgeback dragon. Hone your magical skills while learning about Muggle (STEM) concepts. For ages 5-7, 9 a.m.- noon, March 25-29, CCP, $183. Harry Potter Master Engineering With LEGO — Build Diagon Alley in preparation for your trip to Hogwarts School of Witchcraft and Wizardry. Hop on your broomstick and play quidditch, challenge the serpentine basilisk, and face the evil Voldemort. For ages 7-12, 1-4 p.m., March 25-29, CCP, $183. Intro to Fencing Camp — Learn the basic skills of the Olympic sport of fencing. This dynamic activity offers challenges to quick thinking, coordination, strength and agility. Safety is emphasized. All equipment is provided. Wear athletic-type clothing and shoes. For ages 7-12, 1-4 p.m., March 26-28, CCP, $100. Golf +Tennis Junior Camp — Introductory exposure to golf and tennis, all in one camp. Monday and Wednesday meet at the Indoor Tennis Center. Tuesday and Thursday sessions are held at the golf course. Students learn the basics of each sport. If needed, equipment is available. For ages 7-10 or 11-13, 10:30 a.m.-noon, March 25-28, $120. NEW! Intermediate Junior Golf Camp — For kids with golf experience and sound basics. Students learn how to choose clubs, execute better shots, chip and putt at a competitive level. Games are played, emphasizing fun while improving skills. Clubs available in limited quantity, if needed. For ages 12-15, 1-3 p.m., March 27 and 29, GC, $100. Class information is in the Parks & Recreation Activities Guide and online at www.loparks.org. Register by internet, mail or drop-off during business hours at Lake Oswego Parks & Recreation at the Public Golf Course, 17525 Stafford Road, Lake Oswego 97035; or fax 503-697-6579; phone 503-675-2549. Nonresidents generally pay more than fees shown. Scholarships also are available for Lake Oswego residents.